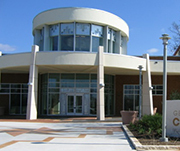 The George Washington Carver Museum, Genealogy and Cultural Center offers the Boyd Vance Theatre and one indoor atrium space for rental. Events can be either private or public. Click on the links below for more information about our rental spaces and complimentary room reservations. What purpose does the deposit serve? It serves as a hard reservation for the space(s) and a damage/cleanup deposit. Yes, renters will receive the deposit upon the condition that there is no outstanding balance and the space is left in its original state. How do interested renters find available dates? Prospective renters should contact the museum staff directly for information of available dates. Call 512-974-4926. The Boyd Vance Theatre seats 134. How many people does the Lobby hold? Depending on the layout of an event, the lobby holds from 100-200 people. If the event is completed seated, only 100 patrons will be fit comfortably in the lobby. If the event is standing and flowing, 200 people will fit comfortably in the lobby. Does the Carver have table cloths available for renters? Unfortunately the Carver does not have table coverings for renters. 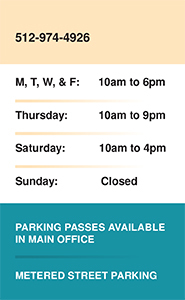 If an emergency arises, the Events Supervisor or Carver Event Staff will assist. Should renters bring cooking utensils or does the Carver provide them? Please know that while the Carver’s stove, sink, refrigerator and freezer are available, it is not possible to provide cooking utensils for events. Can renters store items in the refrigerator overnight? Because the Carver kitchen must remain accessible to clients and Carver programs, overnight storage is not permitted.